39 Masoor, Whole Masoor recipes, Indian whole masoor recipes. Whole masoor can be used in Soups, Salads, Biryani and Sabzis. Barely and whole masoor combine well in this nourishing barely soup recipe which makes a nice soothing soup on a cold winter day. The combination of masoor along with barley i.e. a pulse with a cereal makes this soup a complete source of protein, which is otherwise lacking in a vegetarian diet. The vegetables add plenty of colour and fibre to this nourishing broth. Masoor dal curry soup, there is nothing more soothing than a bowl of this protein-rich curry soup on a cold day made with whole masoor, onions and tomatoes. 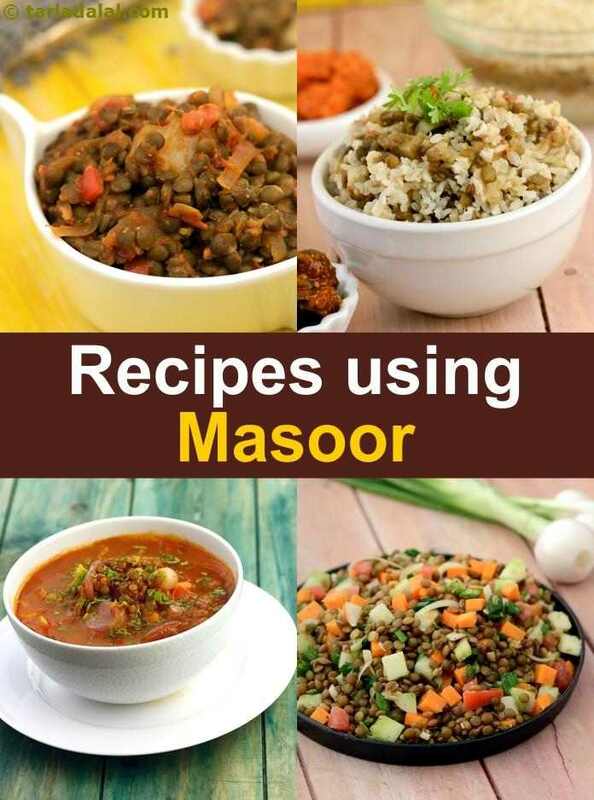 Whole masoor makes a good addition to make Indian salads healthier. We have 3 office salad recipes which are a meal in themselves which contain whole masoor. Try vegan healthy lunch salad recipe, kale masoor office salad recipe and masoor beets, peppers lunch salad. You can toss in more whole masoor into these salads as that will up your protein content and can cut some carbs. Learn to mix and match. You can cook some whole masoor and store it in your fridge for 3 days and toss it daily into your salads. Masoor is used in Indian dals. Panchratni dal recipe is a delightful combination of five dals, simmered with not just whole spices but a bouquet of aromatic spice powders too! The Panch Ratani Dal also gets the right amount of tang from curds and tomatoes, which complements the spiciness very well. Rich in folic acid and fibre, this flavourful dal is also good for your heart. We also have the pressure cooked panchratni dal recipe. Whole masoor is used this tasty brown rice masoor biryani recipe with zero oil used. Here is the healthy masala masoor recipe made from whole masoor, onions and tomatoes. It's a dry preparation and hence i prefer to call it a healthy sabzi which goes well with bajra roti. Great way to up your protein for vegetarians. 1 cup off cooked Masoor dal gives 19 grams of protein. Being rich in Phosphorus it works with Calcium to build our bones. Whole Masoor or masoor dal is rich in Folate, Vitamin B9 or Folic Acid which helps your body to produce and maintain new cells, especially red blood cells. Masoor is is good for diabetics and a healthy heart. See detailed 10 health benefits of masoor dal. Enjoy our 39 Masoor, Whole Masoor recipes, Indian whole masoor recipes below.